So… I’ve been in a crocheting mood lately. Ever since Eve was born, I’ve been itching to get my hands busy with some yarn and crochet hooks. What really motivated me to crochet was finding some amazing crocheting patterns online. My first project is from Crochet Baby Boutique. Her shop is full of adorable shoes, hats and headbands. 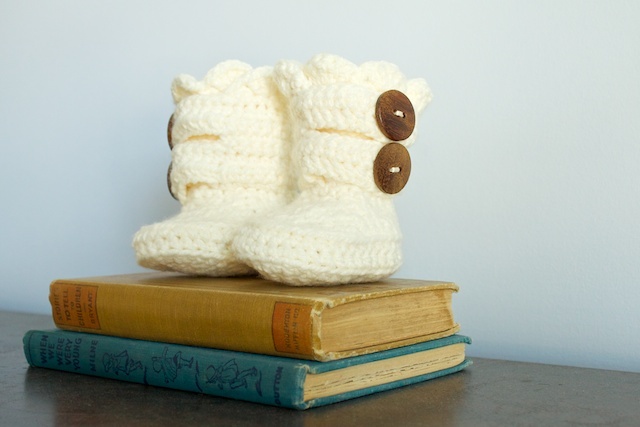 I made these crochet boots for Eve just in time for winter. She wore them to church on Sunday and looked so fashionable. I loved how it turned out with the scallop on the top and the big wooden buttons (I got those from Moda). 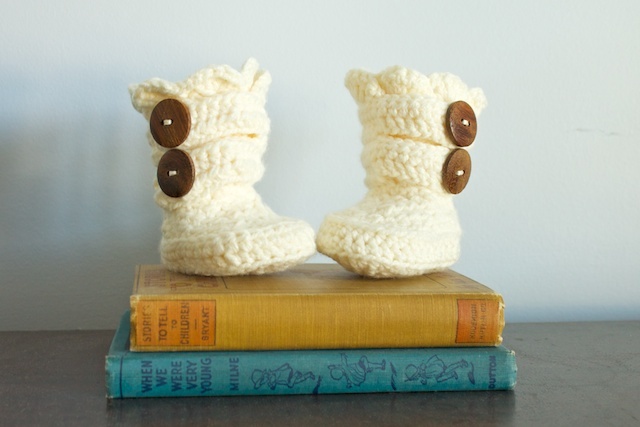 Crochet Baby Boutique crochet patterns are pretty easy to follow. But you do need to know how to read crochet instructions. I would say these patterns are not for beginner crocheters. The patterns come with some pictures in the instructions showing portions of the written instructions. And the pattern has instructions for various sized boots. » Tell me… Do you crochet or knit? What do you like to crochet/knit? Note: Crochet Baby Boutique is a sponsor of Simply Modern Mom. But these are my own words. These are darling! I used to crochet before carpal tunnel. . . . I love crochet, here’s a few of my projects http://blog.mummybrain.com/search/label/crochet are you on ravelry? Hi, I have been searching for a snow boot pattern like the picture you posted for over 1 month. Do you know if this pattern if for free. If you do know where I am able to obtain it for free, please be so kind to email it to me at NIML1904@aol.com. I would appreciate it. My daughter is having a girl and would love to give this to her at her shower. i don’t know where you can get it for free. i purchased the pattern from etsy. Thank you.. I purchased it as per your suggestion. AMAZING.. Many blessings to you as you continue your crochet journey!